You won’t get far as a C# developer unless you know how to write database applications. That is where this book comes in. It shows you how to use Visual Studio 2008 and ADO.NET 3.5 to develop database applications the way the best professionals do. 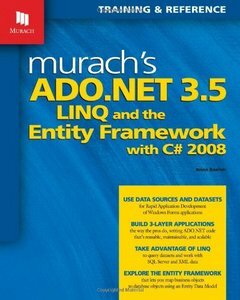 That includes the full gamut of skills you need, from using prototyping features that generate ADO.NET code…to writing your own ADO.NET code from scratch so you can closely control how the database processing works…to using .NET 3.5 features like LINQ and the ADO.NET Entity Framework that actually change the way you think about handling data. What’s more, this book takes you from beginner to database professional in a logical progression that makes each step easier to master.